Are you considering brand revitalization or re-branding your product, service or business? Is your brand under-performing? Or is your brand just not hitting your target audience appropriately anymore? If you feel the need to revitalize your brand, it should not be overlooked and serious steps should be taken to re-launch your business, in this digital era. Having said that though, all brands need to adopt a new skin and synchronize their vision and mission with the changing marketing trends. Re-branding is the process of giving a whole new feel to your established product or business. It is a strategy to retain your core competencies and differentiating yourself from your competitors. Your ‘brand identity’ is the rich and dynamic combination of visual, verbal and sentimental attributes that speak for who you are and what you do and precisely what activities you are engaged in. The way your branding influences your target audience and the way an individual feels and reacts towards a brand establishes a strong ‘brand perception’. Starting from the basic asset like letter head to the way your product is packaged and marketed, websites, print material (brochures, fliers), business cards and social media presence all of it come together to build up your branding strategy and giving a holistic view to the consumer. What is the need for re-branding? Re-branding concepts should revolve around and do justice to your marketing goals and should be a surefire way to carve out a viable way for higher audience engagement. • A company’s website and brand identity should connect with the customers on an emotional level and help improve brand recall. You know you need to re-brand your product or service when your consumers cannot connect your product with the firm. • To recover from vanishing prominence, reduced ROI and deteriorating sales, it’s high time you re-visit your branding strategies and fix the loopholes. Rebranding ideas that rejuvenate your online presence gets the user entranced. • Inconsistent patterns in the way different clients perceive your company calls for a new revamped identity that clarifies perceptions and portrays a unified message about the company’s vision and mission. If your brand message does not articulate your offer clearly enough you probably need to revitalize your branding. • With rebranding, when developed and positioned strategically offers a way of making progress which is sustained, giving the company the upper hand to charge a premium of your choice. • Competitor attacks also fail to cause you any harm when your brand positioning and branding is on spot. Brand evolution is a smart marketing tool that helps your branding stay relevant with your product or service. While some pull it off quite effortlessly, others have to face criticism and re-visit their branding strategies. To make sure your next rebrand meets success; avoid these common pitfalls and notorious re-branding errors that can cost you a great deal of effort and money in the long run. When considering re-launching your brand you need to assess why the rebrand is needed? What does your brand portray about your company? Your brand image should be in close harmony with your company motto and for that you need to carry out a thorough and comprehensive market research. An apt example of a re-branding failure from which we can learn a lesson is one of GAP. When GAP tried to re-design its logo, it turned out to be a huge disappointment for the target market as the company image was greatly compromised by the drastic change in the logo design. Trying to stay abreast with current times is always desirable but one definite lesson to learn from the unfortunate GAP incident is thatre-branding is a serious game and there are definitely no shortcuts to it. The company’s essence should undergo a revolution rather than just the company image itself. Customers are constantly on the driving seat and both current and potential customers should be the inspiration when formulating solutions. Their needs, wants, preferences and consumer behavior should be the basis of your branding strategy. Your customer can make or break your brand. Re-branding certainly does not mean that your existing brand equity is of no importance or is useless. You need to precisely gauge whether you need a total revamp or just a slight tweaking in your branding campaign. Not taking into consideration the existing brand equity can be quite damaging to the way a brand is viewed and perceived. You do not need to go overboard and just follow the herd when a small change will do the needful. Before you undertake the highly important task of revitalizing your brand image it is important that you carry out the necessary investigation and background checks to assess the needs of the target market. Your pre-existing customers are a combination of loyal and disloyal customers. If you do not retain the core attractiveness of the brand you might end up losing your valuable market share to your competitors. The logo is representative of your company image and processes. However, very often a brand is confused with its physical symbols: the logo, company name, the physical presence of a website introducing the company to the customers or the company culture for that matter. Re-doing the company symbol is not the ideal solution to alleviate your problems-it could possibly aggravate them as well. Brands are an amalgamation of both the material and immaterial elements. Target audience, customer preference and perception, their experience to the corporeal nature of the website, the visual effect and feel to the customer service provided, retailing services and web environments and the way the company motto is communicated to the customer. Before rebranding your company, for example changing the brand name from ‘Ciplex’ to ‘Coplex’ was a logical decision for the respective company. A lot of brainstorming went in to decide what the brand name would actually stand out and add meaning to the business. The prefix ‘co’ was purposefully added to highlight the co-creating with their clients and foster teamwork and partnership. Re-branding is not a random process but lays its foundation on a well-knit logical story that penetrates both the internal and external environment. The rebrand’s story must be practical and sketch a scenario that does justice to the prevailing situation and established brand experience and customer perception. The biggest achievement lies in the fact that it is deeply engraved in the minds of the internal employees. When they will embrace the brand identity, they will automatically perpetuate it ahead and walk and talk brand everyday which will pass on to the target audience. The more credible the story the more effortlessly it will trickle down the hierarchy and consolidate the brand image both in the eyes of the customer and the employee. The promise that you make to the customers should be deliverable from the HR to finance department. 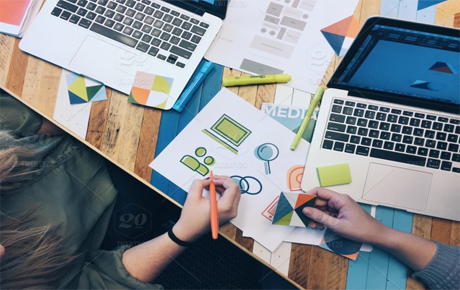 Some company’s or creative agencies prefer that their in-house creative teams set to work on re-creating and developing a logo and brand name that will do justice to their company vision and mission. This makes the process fast and cost-effective. However, come to think of it developing a brand internally will be a reflection of internal plans and perceptions rather than how the target audience views your brand. Hiring external brand consultants helps your company to add an external element into their branding. It will give you valuable insight into how your company is viewed by a third party and what your potential clients think. Hence, you should always think of outsourcing rather than making the process personal and centralized. Yes! You need to give tough competition to your competitor operating in the same niche, but you can always drive inspiration from various markets, that have even a tad bit of similarity. Marketing techniques is all about creativity and that can be learnt from any good marketer, irrespective of the field they are operating in. Religiously following just your industry trends may limit your vision and hinder your growth not allowing you to explore new avenues. When rebranding, it is highly recommended that you mingle with other market leaders and gain feedback on what other industries are implementing regarding customer experience and care. Innovation and creativity from diverse areas can do wonders to your branding strategy. You’re never too small to re-brand. You might be e a start-up firm or an entrepreneur but that certainly does not deem you unqualified for the need to redesign your branding strategy. As markets evolve and shifts in consumer preferences take place, brands need to stay abreast of the competition and maintain the appeal and customer interest and engagement. For this very purpose, they have to plan their brand positioning so that their efforts are directed in the right direction. A firm no matter how small eventually grows into something substantial. Taking your brand to a whole new level and redefining your existence is what will differentiate you from the rest. By-passing the basics of branding can be a major blunder as the way you add the finishing touches to your website, marketing tools and the physical environment in which you operate is of utmost importance. Brand experience is bound to reach a low ebb if all customer touch points are not kept in mind while designing your re-branding strategy. You team should be responsible and well versed with market knowledge and project management skills. The person responsible for effectively pulling of the branding strategy should have the necessary skillset and intellect to make the project reach its destination. Follow up is of utmost importance after implementation, as customer service increase customer engagement, satisfaction and loyalty. Obviously an initial investment is required to accomplish any challenging task but it certainly does not mean that it cannot be accomplished economically. There’s always a less expensive alternative for every strategy which is a product of small but highly talented branding agencies, professionals and extremely talented in-house people. Sometimes highly motivated university students or basic start-ups can yield worthwhile results. You need to place yourself in your customer’s shoes and make it a point to see your brand from their perspective. Simply put, authenticity is the act of being true to who you are. Your die-hard loyal customers might also switch to another brand if you fail to deliver your promise. Never over-exaggerate what you do and make practical promises that are easier to accomplish and have an element of humanity in it. Trust me you will see how your customers place unwavering trust in your brand and will enable people to relate to your business. What’s better than being called a reliable, trustworthy company who might even deliver more than expected? Turning audiences into advocates by this strategy wouldn’t be a surprise. How Small Businesses can benefit from Digital Marketing Campaigns? Why your marketing strategy needs the right logo and what makes it right?